The uninhabited island of East Caicos is best known for its plantation ruins and cave artwork. The island is 18 square miles and is mostly covered by swamp and mangroves. The highest point in the Turks & Caicos is on East Caicos. At the beginning of this century, Jacksonville, the northernmost point of the island, was the center of administration of a 50,000 acre sisal plantation. 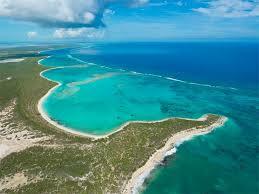 On the north of East Caicos is Flamingo Hill which has an elevation of 156 feet, while Philips Reef guards the coast. It is advisable to have a local pilot navigate the difficult channels into anchorage at Breezy Point, where the employees of the East Caicos Sisal Company lived in 1891 while working in the sisal industry. Stretching for some 20 miles from Drum Point to Flamingo Hill is also the lovely reef harbor of Jacksonville. 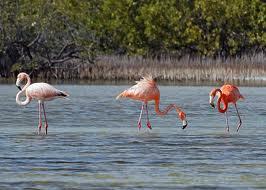 T he island has extensive savannas on the north side, which are ideal for ranching, while near Lorimers Point is an area with flamingos, wild ducks and pigeons. There are many ponds and lakes on the island and at White Top Pond grow the Palmetto thatch palms, which are still in great demand for making hats. Before World War II, hunting parties went to East Caicos to shoot wild cattle. These animals were relics of a herd of over 1,500 developed by the late J.N. Reynolds, owner of the Breezy Point Estate, who used to supply all the meat required at Grand Turk. The meat from the cattle reared at Jacksonville was very lean and had a particular sweet taste, which was said to be occasioned by the salty diet on which the animals were fed on East Caicos. Hides were also exported to Haiti. These animals have now been virtually exterminated by the local hunters. 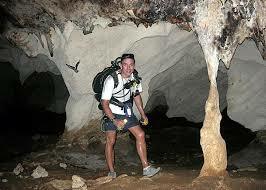 There are several caves on East Caicos near Jacksonville where skeletons and artifacts have been found. The two principal caves were mined for guano and were known as “Old No. 1” and “No. 2” caves. In the course of the mining operations, several skeletons were found, along with various artifacts including a wooden stool and a platter. In another cave, known as “New No.1”, there is unmistakable evidence that the main chamber had been used either as a place of worship or as a council chamber. In the main chamber, various petroglyphs are on the walls as shown in the illustration. A large stone in the main chamber had evidently been cut into a crude semblance of couch or altar. There is also a cutting on the roof of the cave directly over this stone. In addition to the petroglyphs, there is a head, slightly larger than life-size, cut out in the rock of the main chamber like a gargoyle. Another cave on East Caicos, at Flamingo Hill, has a shaft, which runs down perpendicularly for about twenty feet. The artifacts found here include a small head belonging to the rim of a bowl, four shards of ornamental pottery, about fifteen plain fragments, a jadeite chisel highly polished with a cutting edge, and a black flint scraper, also highly polished with a cutting edge. There are also about eight Lucayan mounds in this area.